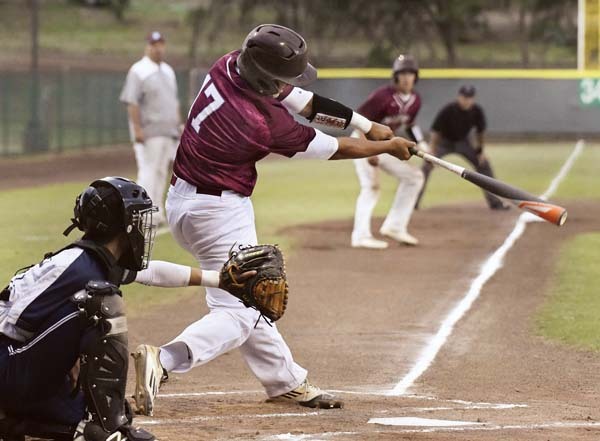 WAILUKU — In front of a raucous, packed house at Maehara Stadium on Friday night, the Baldwin High School baseball team looked to its ace in a crucial game against Kamehameha Maui. He retired the last 10 batters he faced, and three of the last four were strikeout victims. The Bears scored single runs in the first and sixth innings. Baldwin had just seven hits over the first two games of the series, a 2-1 win on Wednesday and a 2-1 loss on Thursday. Friday, the Bears stranded nine, but collected six key hits. 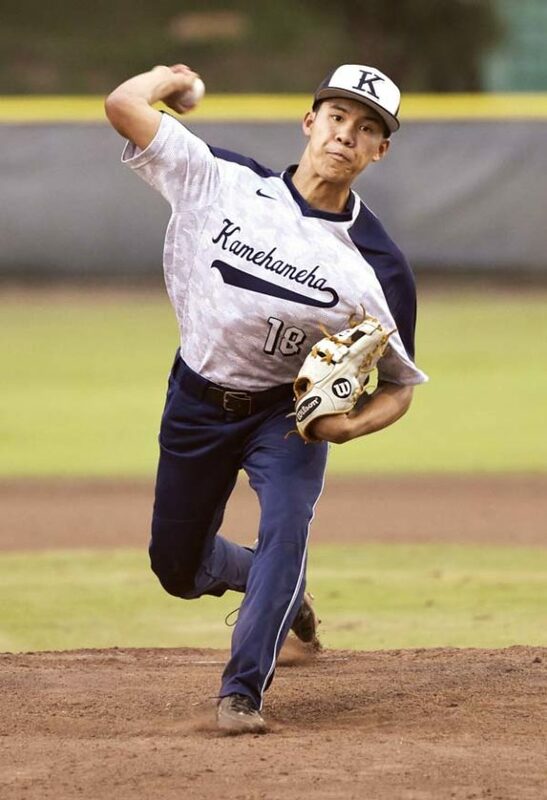 The pitching matchup added to the suspense — Hoopii-Tuionetoa throws his fastball in the mid-90-mph range and Tanaka, a sophomore, spun a one-hit, complete-game gem in his last outing, a shutout win over Maui High. The Bears struck for a run in the top of the first when Chayce Akaka led off with a single, stole second, took third on a sacrifice bunt by Haku Dudoit and scored on a single by Cade Kalehuawehe. After threatening to score several times, the Bears pushed the lead to 2-0 in the sixth when Kaipo Haole, the first game winner on the mound and the shortstop Friday, slapped a line-drive RBI single to right field. The Bears may lose their No. 18 spot in the USA Today national rankings with Thursday’s loss, but they rebounded well following that close call. 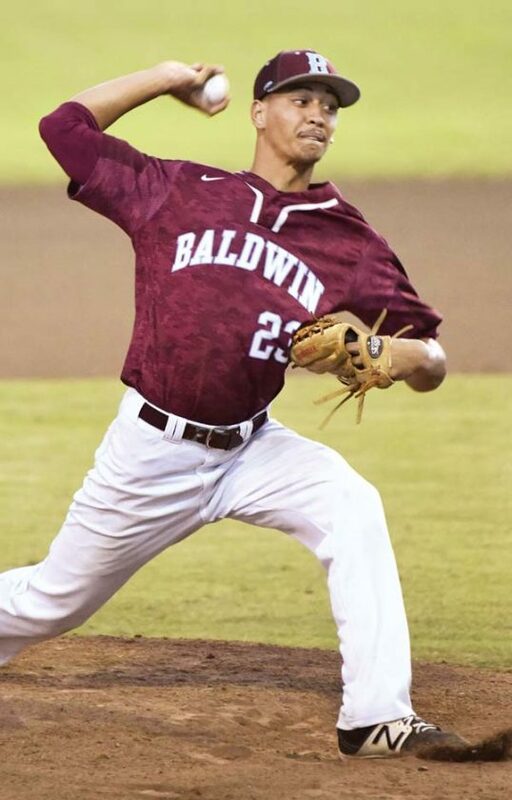 “Bubba was able to command his fastball and they weren’t able to … I mean, they hit the ball well a few times, but he was able to come back and battle back,” Baldwin coach Shane Dudoit said. “It is a tough league. Clinching a (state) spot is comfortable, but there’s a lot of work that we’ve got to get done. We want to get there and be playing May 11th at 7 o’clock (in the state final). Kamehameha Maui is looking for its first state berth since 2011. Bubba Hoopii-Tuionetoa and Cade Kalehuawehe. Graydon Tanaka, Taylor Arashiro-Mamuad (6) and Ross Panlasigui. W–Hoopii-Tuionetoa. 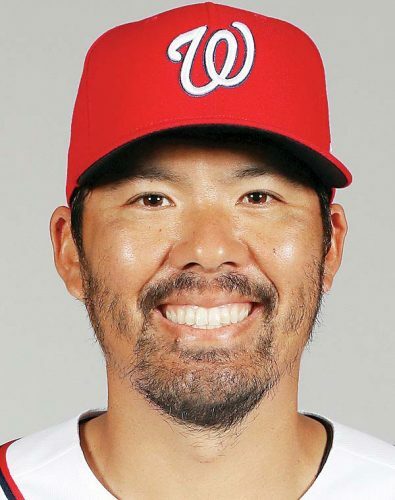 L–Tanaka. 2B–Baldwin: Haku Dudoit. Leading hitters–Baldwin: Chayce Akaka 2-4, run. 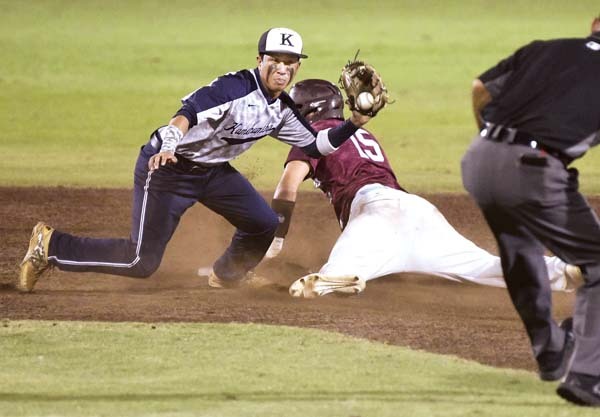 Kamehameha Maui vs. King Kekaulike at Maehara Stadium, 3:30 p.m.
Baldwin vs. Maui High at Maehara Stadium, 5:30 p.m.